Hairy Mountain Folk: It´s Carnival time! Banos is apparently where Ecuadoreans come for their holidays and weekends, and as it´s Carnival, the place is jam-packed with families, groups of teenagers and backpackers. It´s not really carnival in the Rio de Janeiro sense, with lots of flesh and samba - think of it more like Canberra festival. There are lots of food stalls selling fried pork and roast chicken (smells heavenly but I have resisted so far), a few tinpot little bands playing under backyard-style marquees, and EVERYONE is armed with spray cans of silly foam. Nowhere is safe, although I´ve noticed people are quite careful not to spray Phil, probably because he´s twice the height of everyone here and they rightly suspect he´ll dangle them by their ankles if they get him. Didn´t stop one little squirt from doing a drive-by spray on me, which earned him a very rude blast of swear words (hope he didn´t speak English). 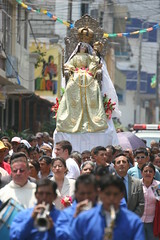 There have been a few processions, including this one carrying the town´s Madonna statue around, dolled up to the nines. Wasn´t much of a cheery affair though, the brass band sounded like they were playing at a funeral. We´re spending a few days here just meandering around and taking it all in, and of course watching the locals. 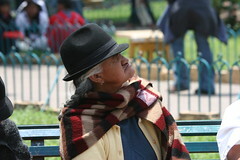 Seen some great South American faces of late - here are a couple of photos. 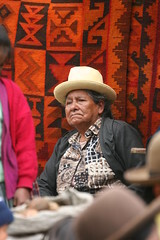 Top one is taken here in Banos but the other was take in Peru at Pisac markets.